Traditional Chinese Medicine theory is that the first line of defense in keeping our immune system strong is called the wei qi. This is qi energy that circulates just beneath our skin and regulates sweating and immunity. Traditional Chinese Medicine and Acupuncture has been used for thousands of years to help keep the immune system strong. Wei Qi is dependent on lung function and controls the opening of pores on the skin. It keeps pores closed thus preventing disease factors from getting into our bodies. As an example, in a cold wind if our pores are open it is easy to catch a chill or cold. A cold wind on our back, or neck, can cause a stiff neck, or shoulder, and excess heat, or sun, can cause heat stroke. Some tips for encouraging a strong immune system. 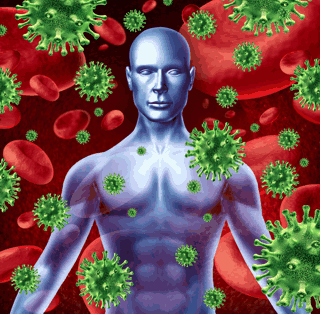 A healthy balanced body has a strong and effective immune system. All the things that leave us feeling run down, tired lethargic or depressed will lower immunity and can compromise how our bodies response to pathogens. Manage stress and working hours where possible. A cool shower once a day can be helpful to boost wei qi. Exercising outside is beneficial, whenever the weather is appropriate. If the weather is not co-operating, then exercise inside. Avoid antibiotics, antihistamines and sinus medication, if at all possible, when you feel ill.
As the season changes to Fall consider wearing a scarf around the neck and also wear socks to keep cold winds from entering the body. If you feel ill be sure to get plenty of rest, take extra nutrients and herbs, have a few Acupuncture sessions and support your body giving it time to naturally overcome an infection. Giving the body time to rest and overcome the infection is very important. Trust your body to be strong. Regular monthly Acupuncture sessions support and strengthen immunity. Scientific research shows that Acupuncture increases the white blood cells in the body and moderates the immune system allowing it to react swiftly and strongly to threats. Schedule an Acupuncture appointment and let the ancient principles of Traditional Chinese Medicine help you stay healthier this season. Call our office today for an appointment 480-671-5178.